Too self-conscious to smile? We can help to restore your confidence. Do you want a whiter, brighter smile? If the colour of your teeth is a concern for you, we can certainly help. We will do our very best to improve the shade of your teeth in order to get you smiling with confidence. At Omnia Dental Spa we have helped hundreds of clients, just like you, to achieve the brighter, whiter smile that they have always wanted. Professional teeth whitening is one of our most popular treatments at Omnia Dental Spa. The main reasons for this popularity are summarised below. Your dentist will ensure that your gums and lips are protected with a special barrier coating during the whitening procedure. A pH booster swab will be applied to your teeth, followed by the unique (EU Regulations Compliant) Zoom bleaching gel formula. The bleaching gel is activated using the WhiteSpeed lamp to break down stains. After 4 X 15 minute gel applications, your teeth will be up to 6 shades whiter. You will also be provided with a syringe of Zoom DayWhite bleaching gel to continue the whitening process at home and to help maintain your brighter smile. This system is a popular choice with many patients who have an important event coming up where they want to look their very best. If you prefer to whiten your teeth at your own convenience, we are able to offer Philips Zoom DayWhite or NiteWhite kits. Your dentist will help you decide which kit and bleaching gel strength is right for you based on your lifestyle, whitening goals and sensitivity levels. Impressions are taken of your teeth so that our laboratory technicians can produce a pair of ultra-thin, custom-made bleaching trays. 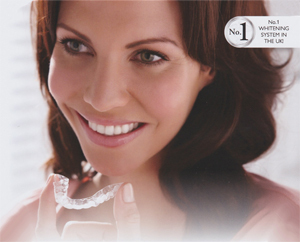 High quality trays are essential to achieve the maximum whitening effect. A week later you are issued with your bespoke bleaching trays and the appropriate Philips Zoom home whitening kit. The fit of the bleaching trays is checked and the use of bleaching gel is clearly demonstrated to ensure that you achieve the best possible results. The trays containing the bleaching gel must be worn for either 30 minutes a day (DayWhite Gel) or overnight (NiteWhite Gel), depending on the concentration of the bleaching gel being used. Your dentist will advise you on the appropriate wear time and frequency for your selected treatment. A significant improvement in the colour of your teeth can normally be expected within 1-2 weeks. Please note that individual results can vary and that darker shades will take longer to whiten. Your dentist will discuss this with you, if appropriate. Please watch this clip for an overview of the home whitening procedure. The main advantage of the home whitening procedure is the flexibility and control that it offers to the patient. In addition, maintenance is simple as 'top up' syringes of bleaching gel are available, from Omnia Dental Spa, to help keep your smile in tip top condition. Yes. Numerous clinical studies have shown that whitening your teeth with carbamide peroxide or hydrogen peroxide gel, under the supervision of a dental professional, is safe for both teeth and gums. The most common side effects are tooth and gum sensitivity. Your dentist is your best resource to ensure that you are a good candidate for whitening and that you are using the appropriate concentration of whitening gel. Philips Zoom whitening products have two mild desensitising agents – potassium nitrate and Amorphous Calcium Phosphate (ACP), to minimise tooth sensitivity. Whitening treatments help to remove existing stains and the results of your whitening treatment will normally be visible for up to 2 years after treatment. However, due to the consumption of tea, coffee, red wine and cola drinks or just through natural ageing, your teeth will tend to discolour again over time. This process will inevitably vary from person to person depending on their diet and other lifestyle factors such as smoking. Maintenance whitening will help to combat recurring discolouration. In addition, Philips Zoom whitening products also contain ACP, which has been shown to help reduce whitening fade-back. There are many causes of tooth discolouration. Some of the most common include the consumption of strongly coloured foods and drinks (coffee, tea, red wine). Some medications, ageing, smoking and trauma can also cause teeth to discolour. With Zoom 'In-Practice' whitening, you will see significant and noticeable results in just 1 visit. With Philips Zoom 'Take-Home' kits, when used as instructed, you will achieve the same great results in 1-2 weeks, depending on the concentration of the bleaching gel and the wear time that you select.